WASHINGTON (AP) — The United States and China resume talks Tuesday aimed at ending a fight over Beijing's technology ambitions ahead of a deadline for a massive U.S. tariff hike. The White House said that meetings between mid-level delegations will begin in Washington following talks last week in Beijing that U.S. Trade Representative Robert Lighthizer said "made headway" on key issues. WASHINGTON (AP) — President Donald Trump signed an executive order Thursday aimed at encouraging government contractors to "buy American" as part of the administration's efforts to boost U.S. manufacturing. The new order asks federal agencies to encourage those who receive federal financial assistance for infrastructure projects to use American materials and products, including iron, steel, aluminum and cement. Republican members of Congress are telling White House economic advisers Larry Kudlow and Peter Navarro how tariffs have hurt their constituents. The Capitol Hill meeting follows the White House announcement that the U.S. and European Union have agreed to hold off on new trade penalties and the EU has agreed to buy more soybeans and liquefied natural gas from the U.S.
WASHINGTON (AP) — President Donald Trump's trade adviser Peter Navarro expressed regret Tuesday for having said there is "a special place in hell" for Canadian Prime Minister Justin Trudeau. 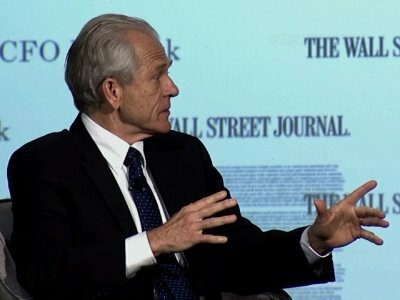 "Let me correct a mistake I made," Navarro said at a Wall Street Journal conference, according to video provided by the Journal's CFO Network. "In conveying that message I used language that was inappropriate." SINGAPORE (AP) — President Donald Trump said Canadian Prime Minister Justin Trudeau "learned" from the mistake of criticizing him and it's going to cost Canada "a lot of money." Trump adviser Peter Navarro, meanwhile, said Tuesday he made a mistake when he said "there's a special place in hell" for Trudeau. ABC's "This Week" — Sens. Lindsey Graham, R-S.C., and Bob Menendez, D-N.J.
WASHINGTON (AP) — After striking a delicate deal with the United Arab Emirates this month on rules for airline competition, the Trump administration went to war with itself. It's a story of how a wonky aviation pact became a bitter, lobbyist-fueled international incident when Peter Navarro, President Donald Trump's trade adviser, repeatedly contradicted the State Department's carefully crafted script about what the agreement actually said. The Emiratis complained to the administration. WASHINGTON (AP) — President Donald Trump says there has been "no folding" in his trade negotiations with China, as he addresses his efforts to help a Chinese telecommunications company that violated U.S. sanctions. Trump tweeted on Wednesday, "Nothing has happened with ZTE except as it pertains to the larger trade deal." He added that, "We have not seen China's demands yet." He also said: "There has been no folding as the media would love people to believe." The White House says Treasury Secretary Steven Mnuchin will lead talks Thursday and Friday with Chinese Vice Premier Liu He aimed at heading off a trade war between the world's two biggest economies. Commerce Secretary Wilbur Ross, U.S. Trade Representative Robert Lighthizer, White House economic adviser Larry Kudlow and trade advisers Peter Navarro and Everett Eissenstat will also participate. ABC's "This Week" — Thomas Bossert, White House homeland security and counterterrorism adviser; Sen. Lindsey Graham, R-S.C.
White House National Trade Council Director Peter Navarro said Monday that President Trump's decision to increase tariffs is to protect national and economic security. "The president has made it clear that without a steel industry, without an aluminum industry, we don't have a country," Mr. Navarro said on Fox Business. Trump administration officials said on Sunday that the president will press forward with his plans to impose new tariffs on steel and aluminum imports, amid growing criticism from some quarters overseas and on Capitol Hill that the move could plunge the U.S. headlong into an unwinnable trade war. The White House's director of the office of trade policy on Sunday said there will be no country "exclusions" at this point for new tariffs on steel and aluminum imports. "As soon as you exempt one country, then you have to exempt another country," Peter Navarro, director of the White House Office of Trade and Manufacturing Policy, said on CNN's "State of the Union." "Canada is 40 percent of the market," he said. "If you exempt Canada, then you have to put big, big tariffs on everybody else." ABC's "This Week" — Commerce Secretary Wilbur Ross; Sen. Chris Murphy, D-Conn.; former White House chief of staff Reince Priebus. WASHINGTON (AP) — President Donald Trump plans to review the U.S. manufacturing base and supply chains because of possible national security risks. The president signed an executive order Friday for a 270-day review to be led by the Defense Department. The order joins a Commerce Department review of imposing steel tariffs on national security grounds as a possible way the administration could reshape global trade without having to negotiate new agreements with foreign countries. WASHINGTON (AP) — President Donald Trump had an apparent glitch Friday afternoon at an Oval Office signing for pair of executive orders: After touting the measures, he neglected to sign them. Trump declared that the two orders would start a "great revival" for U.S. manufacturing, repeating his campaign message that trade pacts have caused factory jobs to flow overseas.